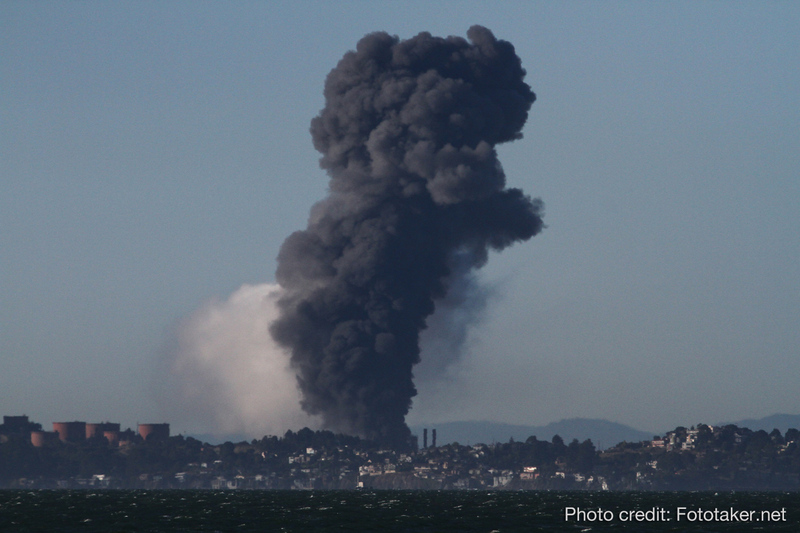 Richmond has suffered a lot of losses from the Chevron Refinery fire last August. The City Government of Richmond has suffered direct losses including costs of emergency services provided, disruption of city services, dedicated staff time to numerous meetings with community and regulatory and investigative agencies, and the loss of property tax income to the city to name a few. In addition the city as a whole has suffered great damages and costs. Examples include the health impact on residents and loss of property values of businesses and residences. (People's homes are their savings.) The City needs to increase services to restore the property values throughout Richmond. In addition, the fire has discouraged businesses from coming to Richmond. The fire also made clear that we need to be better prepared for such incidents with emergency preparedness and warning systems which require considerable costs. It is important to put additional warning systems in place (phone systems, transportation alternatives, and other systematic preparation) and expand our emergency preparedness. Getting such systems and preparations in place has a cost attached to it as well. It is essential that the total costs of the fire be gathered and submitted to public scrutiny. I have put a resolution on Tuesday's agenda (see below) that calls for an expert study and public discussion. It directs staff to coordinate with experts in the field (urban economists, academicians, etc.) to come up with the figures and present them to the public. Such an analysis is necessary before any settlement or agreement through any proposed legal strategy with Chevron is made. THEREFORE BE IT RESOLVED that the Richmond City Council calls for an analysis of all the costs to the city of Richmond including public hearings on these costs as a result of the Chevron Fire of August 12, 2012 before any settlement or any other form of agreement with Chevron occurs. How Much did the Chevron Fire Cost Richmond? Here are some rough estimate ranges of the cost to Richmond from the Chevron fire. Obviously we need experts to get more precise figures. The settlement must also include the costs to the people of the city. This is in addition to individual damage suits brought against Chevron. while the surrounding communities like San Pablo all went up. and Richmond residents opportunities for jobs and income. On 6/25/13 The City of Richmond made a Proclamation honoring its LGBTQQIS-2 residents and the LGBT movement. Hate speech is one of the most difficult issues for those of us who strongly defend the right of free speech. The problem is that hate speech, by creating a climate of fear, discourages other people from participating and deprives them of their rights of free speech. The hate and vulgar speech and atmosphere at the council have already driven away many who would otherwise attend. It is tough to set rules setting the line between hate and free speech. Moreover, this method rarely works in the long run although it may be necessary in the short-run. The most effective way to end the hate speech and atmosphere at Council meetings is for all council members to take individual responsibility to exercise leadership and make it clear that they personally will not tolerate such behaviors at Council Meetings. The problem is that two Councilmembers, Bates and Booze give these hateful behaviors legitimacy by seeming to encourage them from their followers. Nat Bates Hears No Hate! See this clip from recent Council meetings where Nat Bates could hear no hate! In calling what is obviously hate speech, a "point of view" he legitimizes it and promotes it. What is Booze's contribution to the atmosphere? After a proclamation honoring the LGBTQQIS-2 community, the Mayor asked everyone who supported Pride month to stand. The video of the Council meeting shows Corky sitting, looking around, and then at the very last moment when he saw he was isolated, standing. But it is not his delay in standing that concerns us most. It's time for the community to demand that these two so-called leaders help lead Richmond into a proud future and stop encouraging behaviors which drag it into the dirt. Those who no longer attend Council meetings have left the field to the hate promoters. We need people who have good things to say about Richmond and its progressive polices to show up and set the tone for these meetings. It's time for the community to demand that the hate promoters end their shameless behavior. The City of Richmond has the authority and responsibility to cause Chevron to repair the portions of the Richmond refinery that have been identified as dangerously corroded and yet has not exercised that authority. Why not? At the April 2013 Planning Commission, Communities for a Better Environment (CBE) and Asian Pacific Environmental Network (APEN) submitted a petition asking the Planning Commission to hold a public hearing on the petition and then, based on the facts, make a "Declaration of a Dangerous Building Condition". This declaration would apply to the portions of the Chevron Richmond refinery that have been identified by Cal OSHA, the US Chemical Safety Board (CSB) as well as Chevron's own documents, of being dangerously corroded yet having not been repaired. The "Declaration" would then require Chevron to abate the dangerous conditions and repair them. These unrepaired areas are a clear and present danger to the health and safety of Chevron workers and the West County community. Under the California Building Code it is the responsibility of the Building Director to make this declaration. In Richmond, Planning Director Richard Mitchell is also the Building Director. Despite the City Council adopting a resolution directing staff to implement the findings of the CSB, including the urgent findings to exercise its local authority to conduct a corrosion audit and force repairs of the dangerous portions of the refinery, Richard Mitchell has done nothing except protect Chevron from any accountability. A committee of the Planning Commission presented a resolution at its July 11, meeting that was adopted unanimously. It expresses the Commission's concern about the corroded sections present and calls upon Richard Mitchell to report back in ten working days with a validation of the citations included in CBE/APEN's original petition and subsequent documents, and to consider making the "Declaration of a Dangerous Building Condition." While this falls far short of what CBE and APEN requested as a community protection measure, it expects the Planning Director to fulfill his responsibility under the law and to adhere to the City Council's direction to do everything possible to protect our community from Chevron's mendacity and unsafe operating conditions. Please show up at the Tuesday's City Council meeting to demand that Richard Mitchell do his job and protect our community by making the "Declaration of a Dangerous Building Condition" causing Chevron to abate these life threatening conditions. The failure to do this allows Chevron to completely disregard the CSB and Cal OSHA reports and preserve its culture of "profits before safety" at the risk of our community. In Richmond, we can do better! Will the BART strike resume on August 4th? BART management hired a chief negotiator with a long record of violating labor law, union busting and discrimination. portraying greedy and unskilled workers BART has trained. With the possibility of a strike at the end of the month, the Chief negotiator has taken a vacation. There are some signs that the BART Board which has taken a hands-off policy on negotiations is beginning to realize what its management has unleashed. Richmond is leading the way in helping stop foreclosures and helping homeowners reduce unreasonably high mortgage payments. We in Richmond are getting national coverage for our daring and progressive policies in fighting foreclosures to keep people in their homes. See The Nation magazine. Of course the banks don't like these progressive programs and are now putting pressure on Richmond to drop them. The ordinance to expand the City's Ban the Box policy to also cover city contractors and recipients of city financial aid has been moved to the Council meeting next Tuesday. The policy prohibits asking a job applicant about prior criminal record on the initial application. For certain sensitive jobs such questions may be asked as the employment process advances. Corky Booze is currently in legal conflicts with the city for violating many codes with his junkyard. This could result in major fines. The lawyer who handles the code enforcement legal matters is on contract to the city. Councilmember Corky Booze participates in the decisions about renewing her contract. (He and Nat Bates opposed it.) Do you think this is a conflict of interest? Come celebrate Jovanka's 50th birthday and at the same time, help raise needed campaign funds. $50 for 50 years. 50/50-we all do our part to keep us on this progressive course in Richmond. You do your part by coming, donating and having fun. Jovanka does her part by being the people's representative.